Occasionally there is some confusion on borders and margins. Unlike a standard photo lab in which prints are usually borderless, FinerWorks offers the option to have a plain white border or borderless for giclee prints on paper. 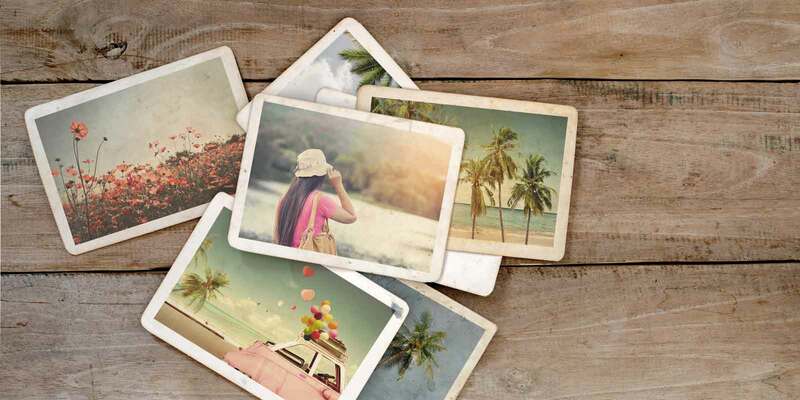 Because many of our customers like to include white space within their image we like to differentiate between the two by defining borders as anything outside of the printed image and embedded margins as any space within the printed image. When we talk about print size to our customers we usually just refer to the actual dimensions being ordered. On our online ordering system this is considered the width and height of the print. It is also referred to as “print size”. But in the fine art publishing industry there is also another term sometimes used which refers to the actual overall cut size of the paper once everything is printed. As a little background to understand this better our printers produce prints on large rolls of paper (or canvas). When the image is completed we cut the printed image from the roll. The actual cut size is called the “sheet size”. 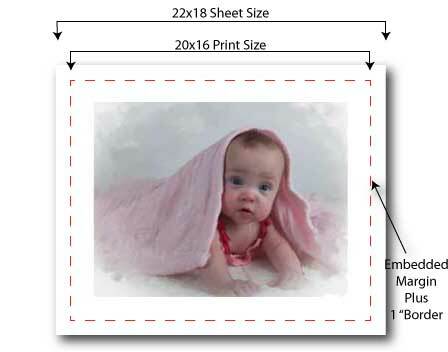 If a person orders a borderless print the sheet and print size will be the same. 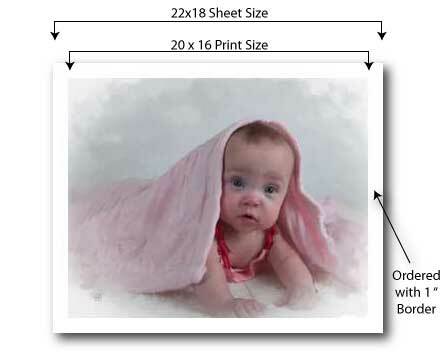 If the customer selects one of our bordered print options (1/2 or 1 inch border) then the sheet size will actually be larger than the print size since it will be including the borders we add to the outside of the print. 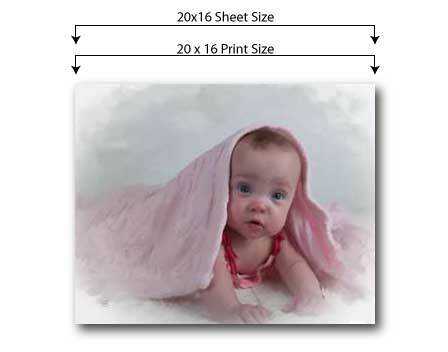 For instance, if you order a 20×16 print with a 1/2 inch border around the print, the print will still be 20×16 but the cut sheet of paper it is printed on will be 21×17 inches. To help illustrate this we will use Monica, who ordered a series of prints of a painting showing her baby daughter. She wanted to try different display options so overtime ordered three different styles of the print. Fig1. This 20×16″ print has no borders. When ordering a print on canvas or art paper you would select the borderless option. Fig 2. This 20×16″ print also has no borders. Instead the customer embedded margins within her image which the printer sees as part of the image. When ordering a print on canvas or art paper like this you can select the borderless option and any margins you have in the image will be treated as part of the image and not trimmed away. Fig 3. This 20×16″ print has a 1 inch border. The customer submitted an image without any embedded margins and chose the 1 inch border option when ordering. The border is added to the outside of the print. This makes the print size 20×16 but the cut sheet size 22×18. Two areas of importance which should be noted if you order borderless prints with embedded margins: bleed and size. 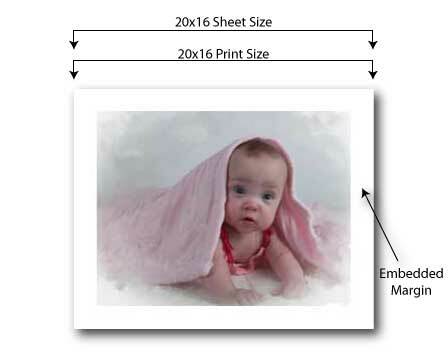 For all borderless prints, regardless if it has embedded margins or not, we must enlarge the image a small fraction of an inch larger than the intended cut sheet size. This allows us to cut borderless prints so no white of the paper is showing on the edges. This works out exactly as intended when you have not added your own margins embedded in the image but if you have then it may mean trimming away a tiny fraction of your embedded margins. It’s hard to tell exactly how much since all prints are hand cut but it may be anywhere from 1/8 to 1/10 of an inch depending on the size. So what if I include both a embedded margin and choose a border when ordering? Any finally it is very important to accurately set the size of your image file before uploading it for ordering. If you have embedded margins in your image and your document is not sized exactly at the same size you select with the order form, you will likely have some of your image cropped. This will mean any margins you add will be cropped. So if in the second scenario Monica had submitted a file measuring 20×16 but ordered it printed at a different size, some of the margins would have been cropped. Updated on 2/25/2013: We have had a few people recently ask if we can add text to prints withing borders they order. For that we recommend creating the embedded margins yourself since our printing process is somewhat automated. A number of artists do this already and include things such as copyright notices, title of the work and name of the artist/photographer in the embedded margins in small print.. When doing so just make sure you don’t select a print size which crops your embedded margins.